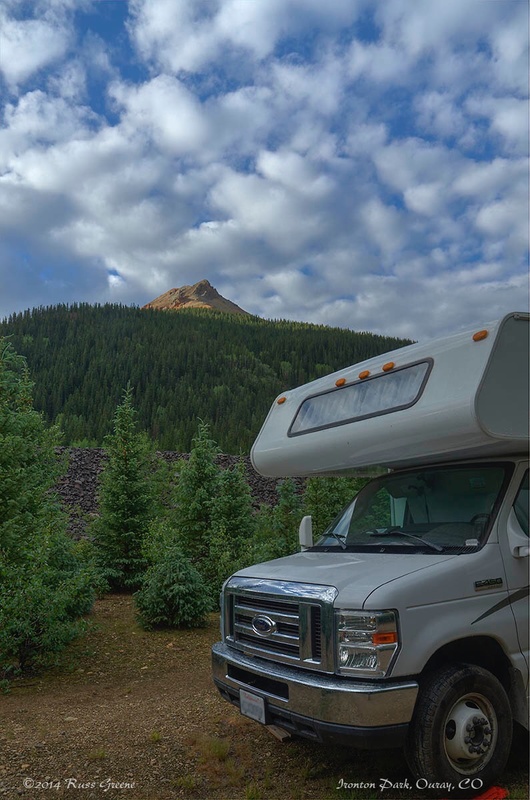 Uncompahgre National Forest; Stay Limit 14 days per month after which you must move 15 miles as the crow flies if you’re going to another Forest Service dispersed camping location. Red Mountain Creek, Ironton Park, CO. I guess that’s iron staining the rocks. 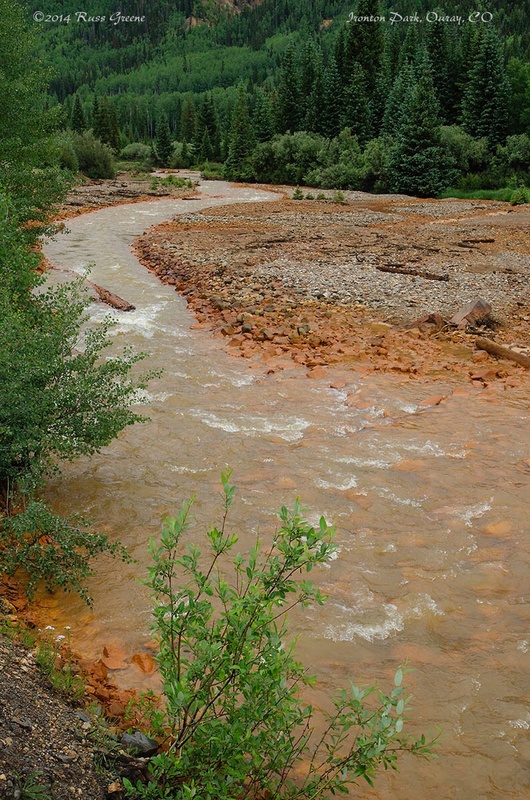 Ironton Park is 8 miles south of Ouray alongside route 550. Ouray, by the way (pronounced “your ray” judging by how the locals say it) refers to itself as America’s Switzerland. 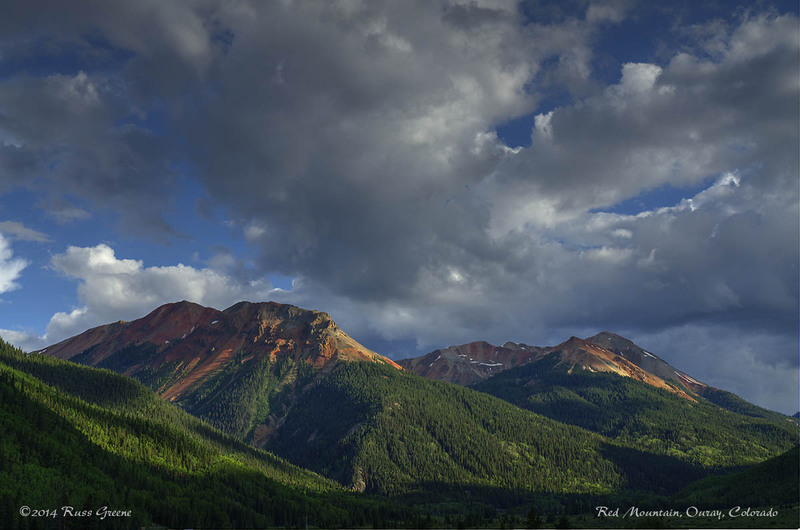 This is true in that Ouray is cradled in a small valley surrounded by towering cliffs. 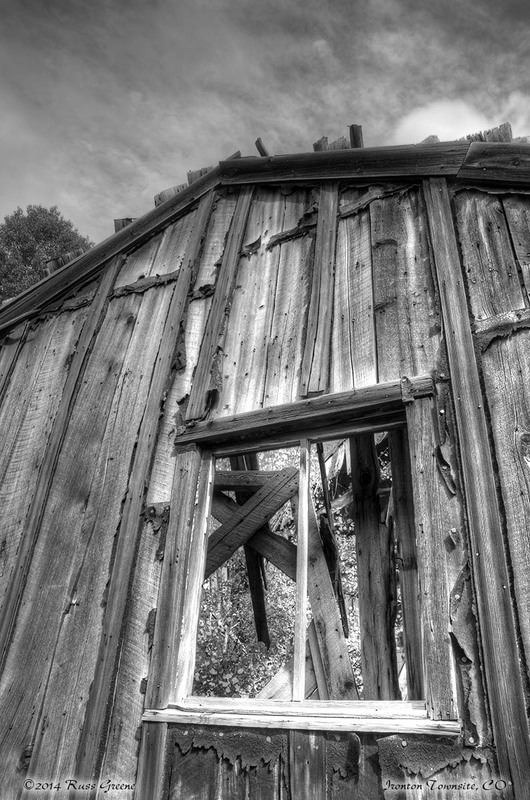 It is a very picturesque little town in that regard, and my drive from Silverton, some 24 miles south, along 550 which is a twisty, windy mountain road in places with steep drop-offs and no guardrails was full of spectacular scenery. The drive is routinely made by all manner of vehicles including large motorhomes, busses and semi-trucks, in case you’re wondering about access. On one side of Ironton Park is highway 550. Traffic passing by is audible, but it’s largely silence punctuated by a few vehicles every minute or two. On the other side of Ironton Park is Red Mountain Creek (see map). This too is audible, at least from my boondocking site which is perhaps 40′ away from it. The blue flag on the map marked “BD Ironton Park” is the site I choose and is along the “main”, dirt access road to Ironton Park (GPS coordinates below). During the day there is an occasional vehicle passing by within a few feet. These vehicles include other motorhomes, trailers and 5th wheels, an occasional motorcycle or car, and ATVs. 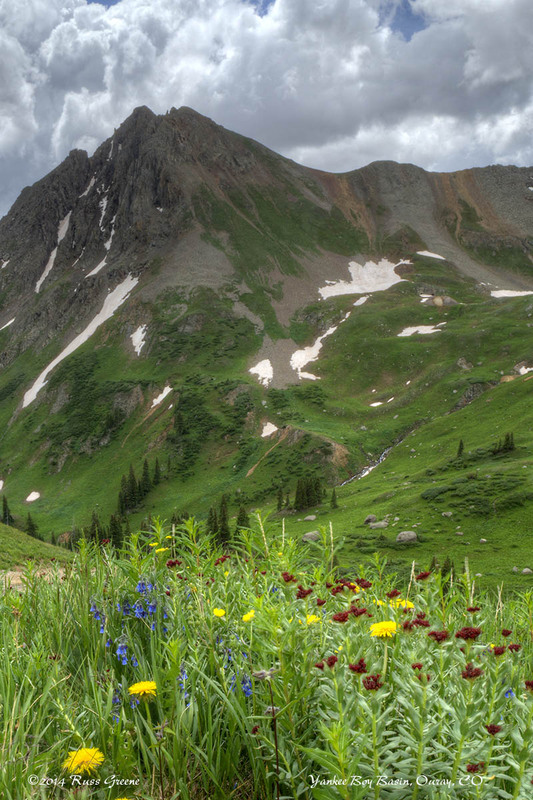 This mountainous area of Colorado is popular with off-roaders as there are many 4WD roads and trails. 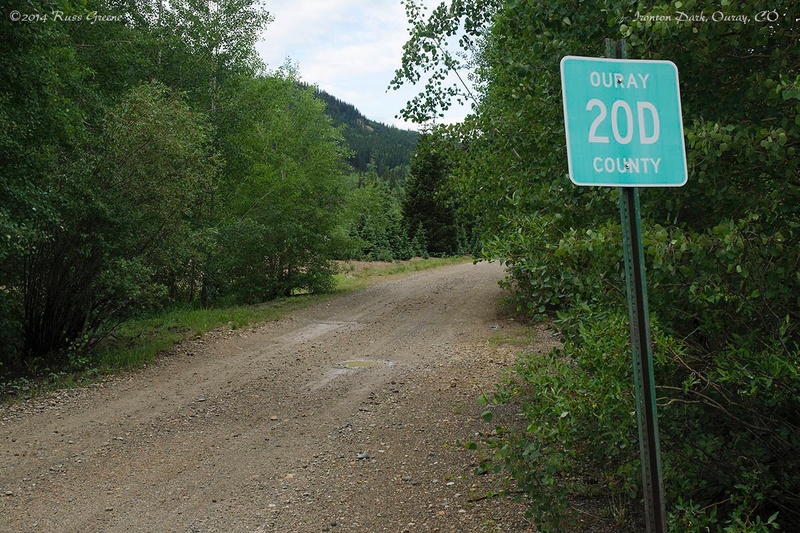 In fact, at the turnoff coordinates I list for Ouray County Road 20D (CR-20D), the “main” road to access the Ironton Park dispersed camping areas (the blue flag marked “BD Ironton Turnoff” on the map), there is a parking area which at times can full of vehicles which have towed their ATVs to the area in order to drive some of the 4WD trails here. I could not hear any of that traffic from my location and I doubt it’s audible from most of the camping areas here either. Porta-potties and ramshackle building, “North Field”, Ironton Park. The port-a-potties disappeared not long after the July 4th weekend so I’m thinking maybe they are only provided during selected, busy periods. 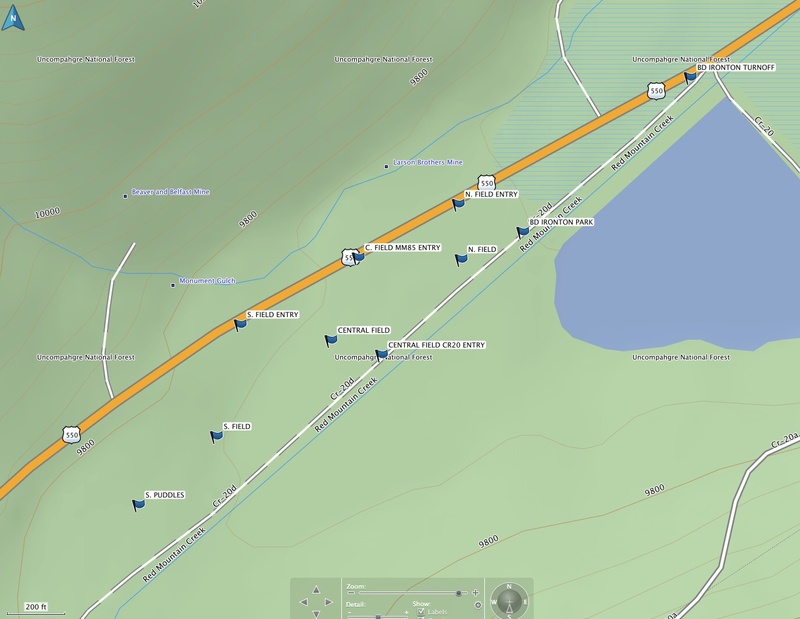 Ironton Park has, from what I was able to determine, 3 fields where people camp, in addition to right along CR-20D. On the Map I’ve labeled the camping areas S. Field, C. Field and N. Field, for south, central and north, respectively. Each field can be accessed either from 550 or CR-20. Only the N. Field entry from 550 was paved. North Field is the smallest of the three and most littered by old shack detritus. It’s also the only one with porta-potties, at least that I saw. There is a drop-off from 550 to each of the 3 fields, another reason why I suggest you look at access via CR-20D. CR-20D runs past all 3 fields at Ironton, looping around them, and ends at 550 at each terminus. At the southernmost terminus where it meets 550 there is a sign marked Ironton Townsite. You won’t see this sign while traveling north on 550. It’s just as well. I do not recommend this entry to Ironton Park as it is narrow and rutted. I do not recommend traveling south on 20D beyond the South Field (marked S. Puddles on the map) for the same reasons. Small, nimble 4WD vehicles such as pick-ups with camper shells may be OK . There are a few, more secluded campsites along this section of the road. 1/10 of a mile along 20D from the south, Ironton Townsite entrance mentioned above is the historic townsite of Ironton which consists of a handful of ramshackle ruins. (/there may be other ruins spread around the area including those found in the parking fields.) You can reach the townsite on foot from any of the fields I’ve described as well so there is no need to brave entry from south end of 20D. 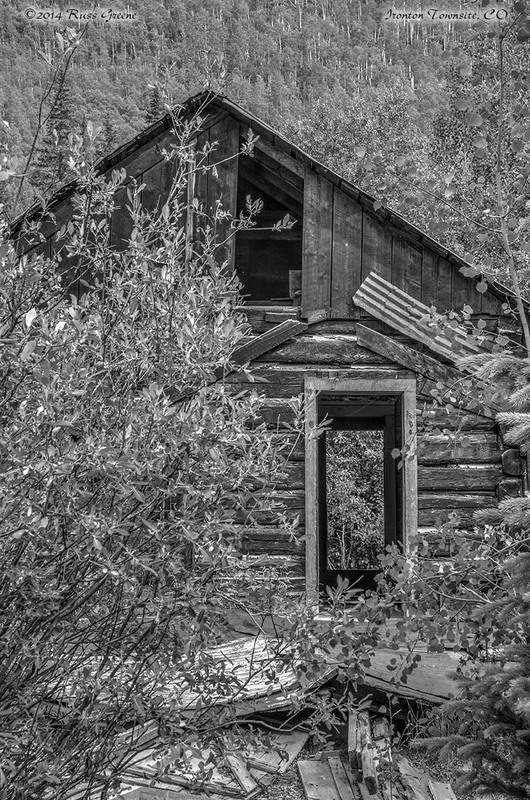 Tangentially, this area of Colorado has a great many old, abandoned mines which you can visit if that’s of interest to you. Ironton Park Boondocking Map. See report for info about it. 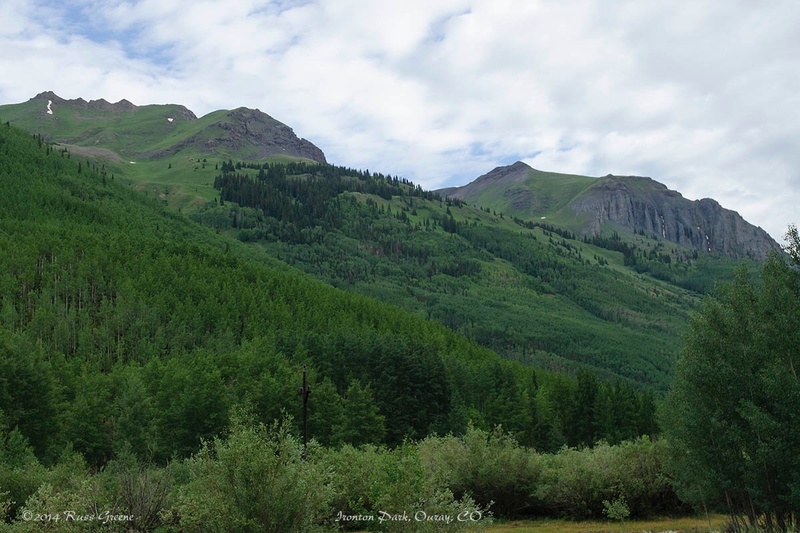 The area is wooded with Aspens which form something of a barrier between 550 and the camping fields, and even more of a barrier by the time you get to CR-20D. From my spot along CR-20D there were excellent views of the mountains to the east and southeast including the upper reaches of Red Mountain #3 if I’m correct. If you wish to check the area out on foot or via your towed vehicle there is a large spot along the west side of 550 next to an old abandoned shack across from the N. Field entry where you may be able to park your rig. Alternatively you may find parking near the north end of Ironton at the spot marked BD Ironton Turnoff. You can probably walk from there to the South Field and back in 20 minutes or so. I had no AT&T signal on my iPhone 5S at Ironton Park and had to drive to Ouray to pick one up whereit was 4-5 bars with 4G. On my Verizon iPad Air I had 1 bar and 1x at Ironton. With my Wilson Electronics Mobile4G Cellular Signal Booster I was able to boost my Verizon 1x signal to a 3G signal and at times was able to pull down a web page albeit very, very slowly. Without the booster? Not a chance. This is in no way intended as a negative comment on the booster. quite the contrary. The booster has made the difference between service and no service for me on many occasions, and while it is not a miracle worker it is a product I feel I can endorse because it has made the critical difference many times. Free WiFi can be found at the Ouray Library and Ouray Community Center (CC) which are next door to each other on 6th Avenue just est of Main Street. Download speeds varied but were usually very good. No passwords were required and I could access the CC connection from outside. There are a couple benches on the corner where I enjoyed sitting in the shade on a warm afternoon. The library also had 3 computers with Internet set up for public use. Google Earth Image of Ironton Park. 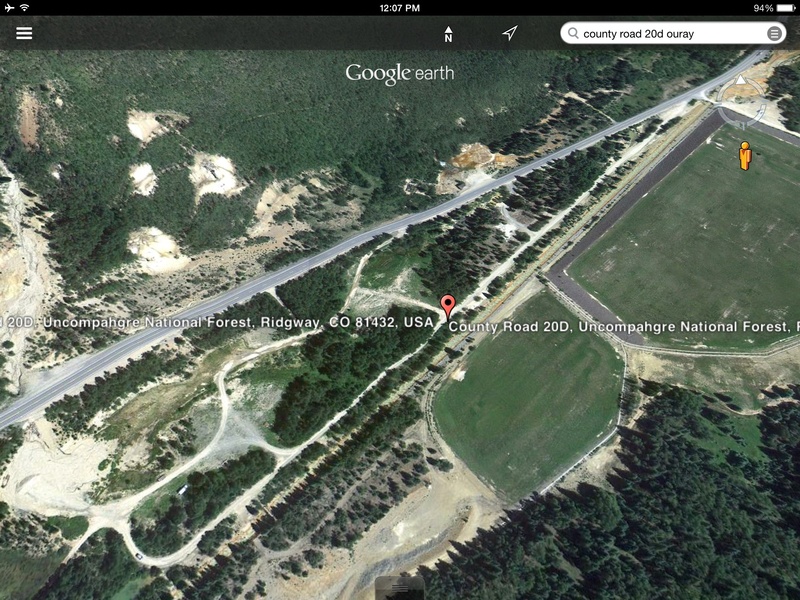 It’s easier to find searching Google Earth for County Road 20D Uncompahgre National Forest. Entry may be easiest from the NE corner near the little gold man although it’s a bit of a trick if you’re traveling north on 550–it may require a few maneuvers, or pulling into the parking area in order to turn around. On a tangential note, I found an excellent map of the Telluride-Silverton-Ouray area that shows hiking trails, 4WD trails, contour lines, fishing info, etc. It’s one of those waterproof, tear-resistant maps. The scale is 1:50,000 so it covers quite a large area, the equivalent of roughly fourteen 1:24,000, 7.5 minute USGS topo maps. It’s made by Latitude 40º maps, http://www.latitude40maps.com. I got my copy at the Silverton Visitor Center. If you’re the outdoorsy type this map may be a good one for you. Ironton Park is on the map, but note that I could not find CR-20D on it. Thank you. This may be an option for our ATV trip. Looking for a camping spot from which we can ride and tackle different trails ea day. You are so welcome, Dustin!. I think you will find a lot of ATV/Jeep/dirt bike activity in the area. I don’t ATV myself so I can’t provide much specific info in that regard but I’m sure there is plenty available. Silverton has a Visitor Center as well as a combined office for, if I’m not mistaken, the USFS and BLM and Ouray probably has a Visitor Center too. 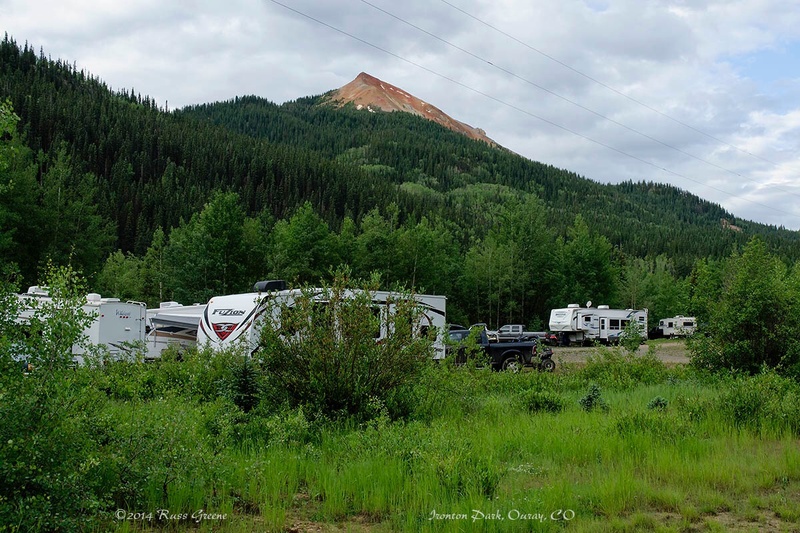 I don’t know what kind of rig you will be using but besides Ironton Park you will find commercial RV campgrounds in both Ouray and Silverton and one up near the Molas Lakes plus a USFS campground or two in the area. 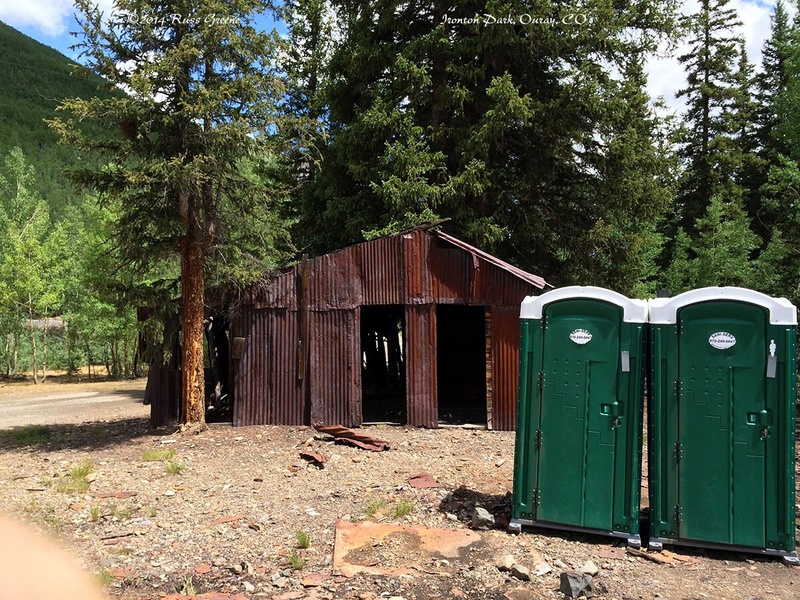 On that note you may wish to take a look at my report on the free Forest Service campground near Little Molas Lake. A great report, Russ. We’ll have to check this area out before heading up Engineer Pass. Sure thing. It’s about a 15 minute drive into Ouray, if I didn’t mention it.